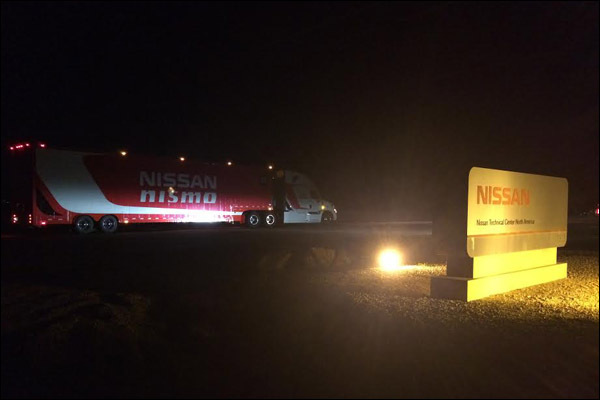 There was much chatter in Bahrain about the progress with the new for 2015 Nissan LMP1 programme. Here though is the very first real evidence of the LMP1 car breaking cover from its California base. 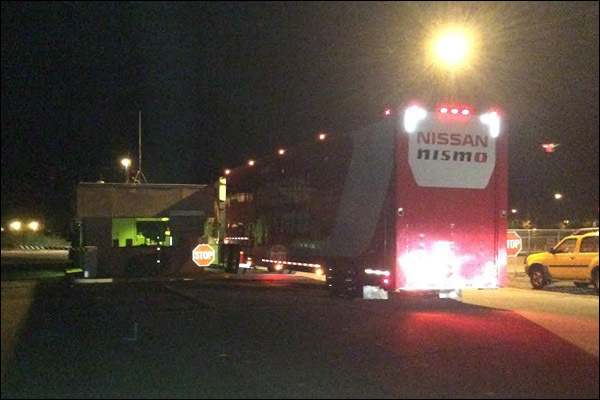 A note yesterday from a DSC reader suggested a race transporter was heading east and sure enough here she is, arriving at the Nissan Technology Centre in Stanfield, Arizona. Is the car bound for track testing or lab work there? Our guess is that lab work would be just as possible back in Southern California, the Stanfield facility includes a fully secured perimeter around a proving ground that includes ” a 5.7 mile high-speed oval and four individual road courses designed to test vehicle durability, reliability, and ride comfort”. That would do it!